COLUMBIAN LAWYERS GET UPDATES ON COURT OF APPEALS CASES AT CLE: The Columbian Lawyers Association invited attorney Brian Shoot to its monthly meeting at Marco Polo Restaurant last Tuesday, April 2, for a continuing legal education lecture on updates in Court of Brooklyn Eagle photo by Mario Belluomo Appeals civil cases. 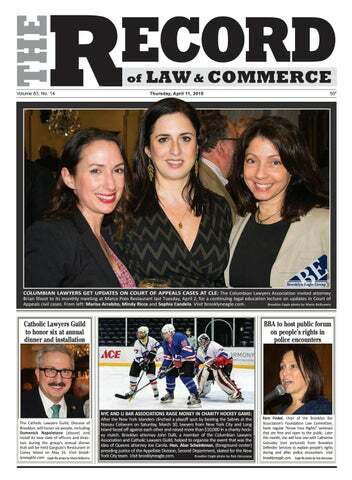 From left: Marisa Arrabito, Mindy Ricca and Sophia Candela. Visit brooklyneagle.com. A bill that will help ripped-off homeowners get their property back has passed both the New York Assembly and the Senate, and is awaiting the governor’s signature. The bill is meant to combat property fraud, which has turned into a crisis in Brooklyn’s gentrifying neighborhoods, according to housing advocates and local officials. Sponsored by state Sen. Velmanette Montgomery (Bedford-Stuyvesant-Red Hook) and Assemblymember Helene Weinstein (FlatlandsSheepshead Bay), the legislation provides greater protections for homeowners who are in default or foreclosure. It also strengthens laws regulating shady property “consultants.” “It has a simple point,” Weinstein told the Record. “A district attorney can bring an action and find fraud, but there’s not a way to get the homeowner’s home back. This allows the DA to get into court and have the illegal deed thrown out, and have the house restored to the owner.” As it stands now, “There’s no legal way to get it back. “While it’s clearly good to lock somebody up, this voids the illegal transfer and allows the owner to get their home back,” she said. Weinstein says she has sponsored this bill in the Assembly for a number of years, but it only passed now that Democrats are in the majority in the Senate. “I’m happy Sen. Montgomery co-sponsored the bill,” she added. New York State Attorney General Letitia James said in a statement on Wednesday that her office receives more deed theft complaints from Brooklyn than the four other boroughs combined, and deed fraud scams disproportionately impact homeowners of color. Brooklyn officials have been sounding the alarm over the past year about increasing housing fraud in Brooklyn. is deed fraud that occurs when malicious actors prey on homeowners facing foreclosure or another financial burden. After identifying distressed properties, scammers pressure their victims into a quick, cheap sale by pretending to be authorities or making too-good-to-betrue promises. A bill that will help ripped-off homeowners get their property back has passed both the New York Assembly and the Senate, and is awaiting the governor's signature. Brooklyn Eagle file photo by Lore Croghan. Homeowners may inadvertently sign away the deeds to their homes, sometimes not realizing the mistake until years later, according to Montgomery. Reversing the deed transfer can be close to impossible when homeowners have to take on the cost and time of a lawsuit. Deed crimes are highly concentrated in Bedford-Stuyvesant, Crown Heights, Flatbush and Brownsville, James said. This is where property values have skyrocketed. According to a statement from Montgomery, fraudulent companies especially target seniors, homeowners struggling financially, and those for whom English is not their first language. If signed, the new legislation would build upon the Home Equity Theft Prevention Act, which passed in 2006 to provide more protections, and transparency, to burdened homeowners who could make for ripe targets. HETPA provides the right to a complete contract, five days to cancel the contract and the right to an honest buyer and a fair sale. The new bill expands on this by prohibiting certain tactics used by scammers. Other fraudulent activities are also prohibited: • Prohibiting deceptive behaviors such as pretending to be law enforcement or government representatives, taking temporary ownership of a deed, or engaging in harassment of the homeowner or the homeowner’s family. • Eliminating the requirement that a homeowner post a bond in order to file a lawsuit to stop a deed transfer. • Prohibiting loan modification consultants from requiring upfront fees for services. • Extending the amount of time a homeowner has to rescind transactions with distressed property consultants from five days to 14 days. In her statement, Montgomery called the bill “a major step forward in addressing one of the most pressing issues among homeowners.” “This is such a huge win for Brooklyn and our state. Fraudulent companies have targeted our homeowners for far too long,” Wright said. “Commerce defies every wind, outrides every tempest, invades every zone.” * The Brooklyn Record of Law and Commerce (USPS 067-080, ISSN 2329-0064) is published 50 times a year, except last week of August and the last week of December by EBrooklyn Media, 16 Court Street, 30th Floor, Brooklyn, NY 11241. Subscription price is $50 per year. Telephone (718) 643-9099, ext: 103. Periodicals Postage paid at Brooklyn, NY Postmaster. Send address changes to Brooklyn Record of Law and Commerce, 16 Court Street, 30th Floor, Brooklyn, NY 11241. *George Bancroft, 19th Century American Statesman & Historian. TELEMARKETERS for INSIDE SALES We are a Brooklyn Media company with multiple publications and websites, located in both Bay Ridge and Downtown Brooklyn. We are looking for talented, experienced representatives to work with our growing sales division in print and digital advertising. • Walk to work • Make your own morning or afternoon four-hour shift • Base salary, plus generous commission • Bonus opportunities Must have: basic computer skills, positive attitude, be fluent in English, and have a clear phone voice. Bilingual is a + Great opportunity to make full-time income with a part-time schedule. OF (FIRST) ALANA (MIDDLE) BELVA NAA MEYER (LAST) METTLE-DEJOSEPH. MY PRESENT NAME IS (FIRST) ALANA (MIDDLE) B.N.M. (LAST) THOMPSON-METTLE FKA ALANA BELLA MERYER METTLE, AKA ALANA THOMPSON-METTLE. THE CITY AND STATE OF MY CURRENT ADDRESS ARE BROOKLYN, NY. MY PLACE OF BIRTH IS NEWARK, NEW JERSEY. THE MONTH AND YEAR OF MY BIRTH IS JULY 1981. We make memories over food. We tell stories over a good meal. But sometimes the meal is a story. And sometimes, it’s so much more. Restaurants are a family’s LEGACY, a chef’s PASSION, a business owner’s PRIDE. From left: Jeffrey Saltiel, Hon. Zhuo Wang, Mehjabeen S. Rahman, Vijay Kitson and Mitchell Cohen. is close; it will be voluntary. I will welcome it only because recently I had a petition that was altered after the decision and e-filing makes it harder to change. I see the value in it. “The plain-language notice of petition will inform tenants of the Right to Counsel program and direct them to the court’s website so they can determine if they are eligible or not,” Gonzales continued. “The goal is to have the tenants meet with their attorneys before they go to court so that we can eliminate the need for adjournments in most cases.” Other changes that were discussed included new preliminary conference orders that are meant to streamline trials and the introduction of mediation from the Peace Institute in cases in which both sides are self-representing. LEFT: Attorney Edward King, who has an office on Atlantic Avenue in Brooklyn, is running for a countywide position on the Civil Court bench in the June primary.